There’s no getting around it—there are only 24 hours in a day. It’s all the time we have and, until our planet is somehow moved several million kilometers further away from the sun (brrr), it’ll never be enough. Despite that, we’ve become extraordinarily good at finding ways to save it. In the realm of social media, scheduling is your not-so-secret weapon to turning those long, wasted hours into effortlessly productive minutes. Instead of waiting for the perfect time to post messages to your social networks, social media scheduling lets you take care of tomorrow’s grunt work in one fell swoop so you can focus on other important parts of your job—whether that’s doubling engagement across all your social channels, juggling a roster of difficult-to-please clients, or crafting a Yelp-crashing cortado. No matter what it is you do, here are four ways you can use Hootsuite social media scheduling to make your day/night/week/month/year/life easier than it was before you read this post. Want to time your social media posts with surgical precision? Or maybe get out of the office a few hours early on a Friday without alerting the boss? You can schedule messages individually and make sure they’re published at the perfect moment so that you appear present even if you’re not. It’s incredibly easy, and you can learn how to do it here. For small businesses that don’t have the budget for a dedicated social media person, bulk message scheduling lets you line up hundreds of messages in advance so that your social networks always have a stream of content. It’s great for planning campaigns, too. And it’ll save you hours and hours of precious time every month. Learn how to schedule your messages in bulk here. What blows up at noon might only blow tumbleweeds a few hours later. Luckily, Hootsuite’s AutoSchedule function can take a pretty good guess at the best time to post based on levels of activity and engagement at certain times of day, so more people see your post and engage with it. 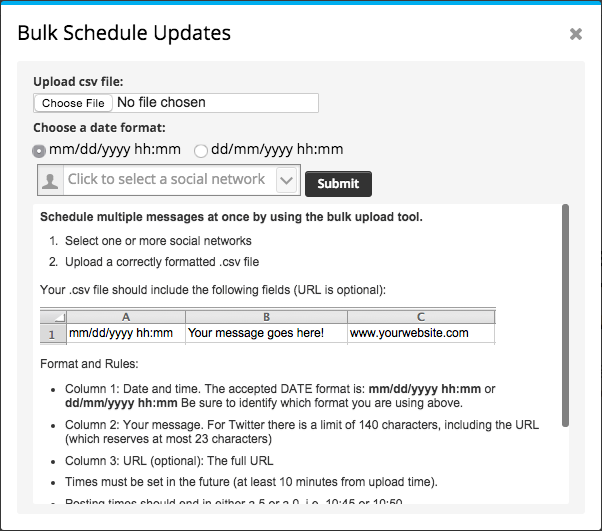 The AutoSchedule feature can be found within Publishing section of your Hootsuite dashboard. Suggestions is the younger, high-achieving sibling of the social media scheduling world. It goes above and beyond by looking for new, relevant content that your audience will love and automatically shares it on your behalf. You can specify what you want shared, where you want it shared, and what time you want it shared. Or you can let AutoSchedule take care of it. The Suggestions feature can be found within the Publishing section of your Hootsuite dashboard. Never heard of Hootlet? That changes right now. Hootlet is a small, unbelievably simple tool that lives in your browser and lets you share content from anywhere online on a whim. No more toggling back to the Hootsuite dashboard or looking for share buttons. Just click the Hootlet icon and you can select the social networks you want to share to and when, or let AutoSchedule choose the time for you. If there’s only one thing you do to make social media scheduling and sharing easier, this should be it. Download it here. To anyone who does not possess the improbable skill of being in two places at once, social media scheduling will help you save a boatload of time. So go ahead and hit that snooze button again, leave early on Friday, spend a few extra minutes in the shower, or even take that vacation you’ve been putting off for the last decade—social media scheduling can do so much the digital heavy lifting for you. Save time with a social media management tool and start scheduling social media posts.